Greetings again from the darkness. This is surely one of the most intriguing movies of the year that is about women and by a woman. 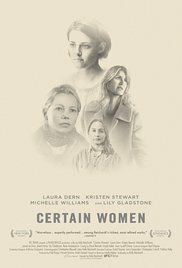 Writer/director Kelly Reichardt (Wendy and Lucy, 2008) has adapted the short stories from Maile Meloy into a film with 3 segments focusing on the daily perseverance of three women in small town Montana (including a rare Wyoming joke). The first segment has lawyer Laura Dern returning to the office after an … umm … “long lunch meeting”. Waiting for her is her client played by Jared Harris (“Mad Men”). The frustration between the two is palpable. Things take a turn for the worse as the sheriff calls Dern to the scene where Harris has taken a hostage at gunpoint. The issues on display here include the lack of respect for a female attorney, her unsatisfying personal life, and the one-way trust that can happen in times of desperation. In the next story, we follow Michelle Williams and her husband James LeGros as they meet with a lonely elderly neighbor (Rene Auberjonis) and offer to buy some limestone blocks that have been sitting on his property for decades. The subtlety of the conversation embodies the missing respect and power of Ms. Williams’ character. Emotions are exploding beneath the surface in the third segment featuring horse handler Lily Gladstone as she stumbles into a class being taught by Kristen Stewart, and is immediately captivated by the smart young teacher. Where this attraction leads is further commentary on the challenges faced by those trying to escape the daily drudgery of their lives. The above recaps don’t come close to capturing the extraordinary quiet and stillness that director Reichardt uses in an emotionally powerful manner. These three women are all intelligent and filled with both pride and visceral disappointment … each quietly suffering, yet trudging forward with the emptiness each day brings. They each have a feeling of isolation – even if they aren’t truly alone, and failed or lackluster relationships certainly play a role. The acting and cinematography (film, not digital!) is as expert as the directing. Ms. Gladstone is truly a standout by saying few words out loud, but speaking volumes with her open and pleading eyes. The nuance of each scene is where the most interest is, and the overall mood of the characters and tone of the stories overcome the fact that we are plopped into these lives with little or no backstory. As each one softly crashes (two figuratively, one literally), we understand these are the faces of strong women who will continue to do what’s necessary … even if that’s shoveling horse poop. The film is dedicated to Ms. Reichardt’s dog Lucy (a key to her personal and professional life). This entry was posted on Thursday, October 13th, 2016 at 11:06 pm and is filed under Drama. You can follow any responses to this entry through the RSS 2.0 feed. You can leave a response, or trackback from your own site.